By Max Muller - Last week, Oregon SolarPAC had what I’d call its first 2016 election success: Oregon Governor Kate Brown made a campaign stop at a clean energy fundraiser, and Oregon SolarPAC was there in force representing at least a third of attendees in a packed room. The best part is each of them got the Governor’s ear for at least a few minutes to speak to her about their businesses and issues affecting solar. “She was all ears,” said OSEIA”s Board President Laurie Hutchinson, who was among them, "It was clear to us that Gov. Brown was listening to what we were saying and deepening her understanding of the issues we face." That successful event was only the first of many opportunities Oregon SolarPAC will create for the solar industry to speak directly with policymakers as part of OSIEA’s new strategy of engaging in election year politics. But although organized political giving is new for Oregon’s solar industry, it's long been standard practice for many, if not most, other Oregon professional trade organizations and businesses to lobby the legislature. Note that these are utilities and business associations who often lobby the same legislators on similar issues to ours but are not always in supportive of the solar industry. It’s plain to see that with them spending generously during the election season, to be competitive, the solar industry should get organized and begin supporting candidates during their elections too. It’s a standard tool for building relationships used by many professional trade associations. 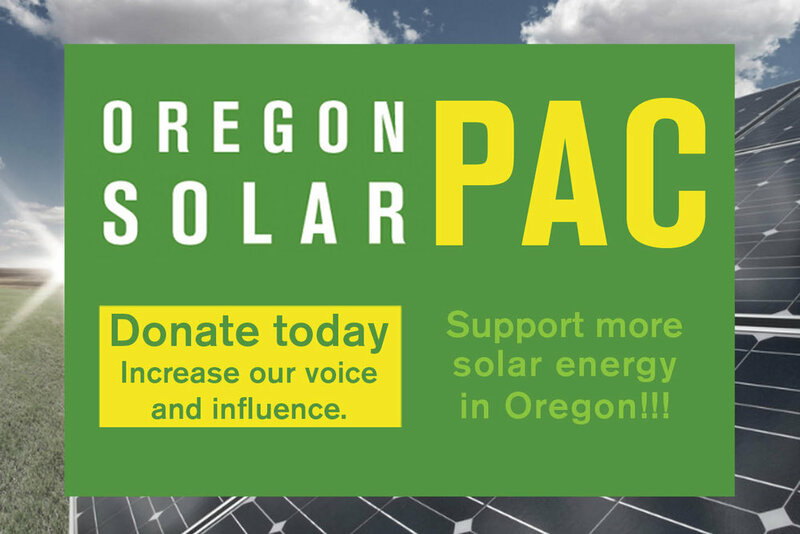 Right now Oregon SolarPAC is working the phones and email to raise campaign funds from small contributions from solar professionals and solar companies, employees, and customers. Starting in August, Oregon SolarPAC will organize dozens of small events in legislative districts across Oregon to donate about $30,000 to candidates seeking election to the Oregon legislature. During those events, Oregon SolarPAC supporters will be able to meet the candidates, discuss solar, and begin building relationships with candidates months before the start of the legislative session. It will be a very strong start for the solar industry in its first year of PAC fundraising. Ultimately, Oregon SolarPAC’s goal is to build legislative champions to advance the widespread adoption of solar energy in Oregon. “Oregon SolarPAC’s work this election cycle is crucial to maximizing the solar industry’s ability to make an impact in the 2017 legislative session and well into the future,” said OSEIA executive director Jeff Bissonnette. If you haven’t contributed to SolarPAC, please consider doing so now, here.